Visitors who plan to be in the Boulder area for a week or more might enjoy taking a tour around the state of Colorado. From Mesa Verde and Telluride in the southwest corner to the high mountain towns of Aspen and Leadville, Colorado offers an enormous array of sights. We've listed some popular destinations below. If leaping through the air as you run down Sahara-style sand dunes sounds fun, you might enjoy a visit to the Great Sand Dunes National Park (map). Located 4.5 hours south of Boulder, the Great Sand Dunes park features dunes up to 750 feet tall. The site was recently designated a National Park, and attracts many visitors to the Alamosa area each year. While you're there, you might also enjoy a visit to tiny Crestone, Colorado (map). Crestone is an electic spiritual community, featuring Zen and Tibetan Buddhist centers, a Carmelite Catholic monastery, a Hindu ashram, and other spiritual centers. If you're hungry, stop by the Desert Sage Restaurant for a home-style meal. Neighboring hikes in the Sangre de Cristo mountains are rugged and rewarding. 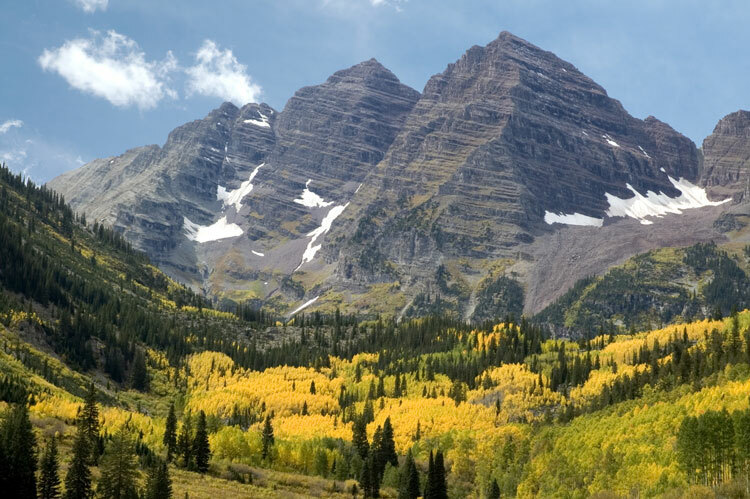 Aspen, Colorado is famous for its mix of affluence, opulence, and mountain ruggedness. The small town of 6,000 people draws millions of visitors each year. While you're there, visit Zele's Cafe for a coffee and a bit of local color. Mountain hikes in the area are plentiful — the twin Maroon Bells fourteeners are a particularly scenic place to enjoy the fall aspen trees. The nearby towns of Snowmass and Glenwood Springs are also fun to explore. On your way there, visit Leadville (at 10,000 feet, one of the highest towns in the United States) and stunning, high-alpine Independence Pass. A trip to Aspen (map) from Boulder via Leadville takes approximately four hours. Steamboat Springs (map) is a popular ski town in the winter. However, in warmer weather it's also a great base from which to explore north-central Colorado. The town of 10,000 people is surrounded by the scenic and rugged Yampa valley. The Yampa River weaves through town, and is a popular spot for inner tubing. While you're exploring in town, try Azteca Taqueria for a quick burrito. The patio of the Yampa Blue coffee shop and store is a great place to watch the summer sun set. Book lovers should visit the Off the Beaten Path bookstore. Steamboat is roughly 3.5 hours from Boulder. Telluride is near the southwest corner of Colorado, almost seven hours from Boulder. However, many visitors find that the trip is worth it. A rugged and beautiful small mountain town, Telluride (map) is the home of the Telluride Film Festival and the Telluride Bluegrass Festival — as well as warm-weather hiking and cold-weather skiing. Nearby Ouray is known as the "Switzerland of America", and hosts the famous Ouray Ice Climbing Festival. Mesa Verde National Park, known for its remarkable cliff-dwellings, is a couple of hours away. College-town Durango serves as a nice home-base to explore the region.